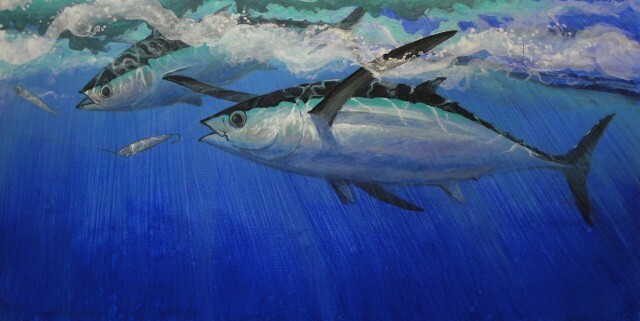 BD introduces Amadeo Bachar, a very talented artist who shares his passion for marine ecosystems through his art. A:Because my background is in freelance illustration/scientific illustration I’ve found myself working in many mediums from graphite and pen to watercolor, acrylic and oil. In many cases, especially art designed for t-shirts, I will render in photoshop. For the most part, I do my fish identifications in watercolor and gouache. 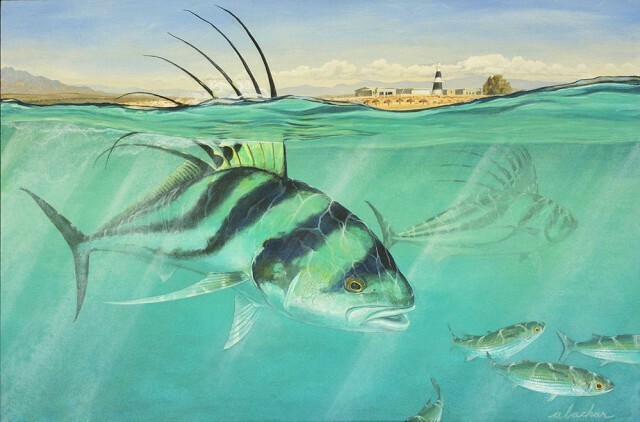 I find that it’s a superior medium for capturing the subtle details in the fish as well as a more lifelike medium for a fish out of its environment. 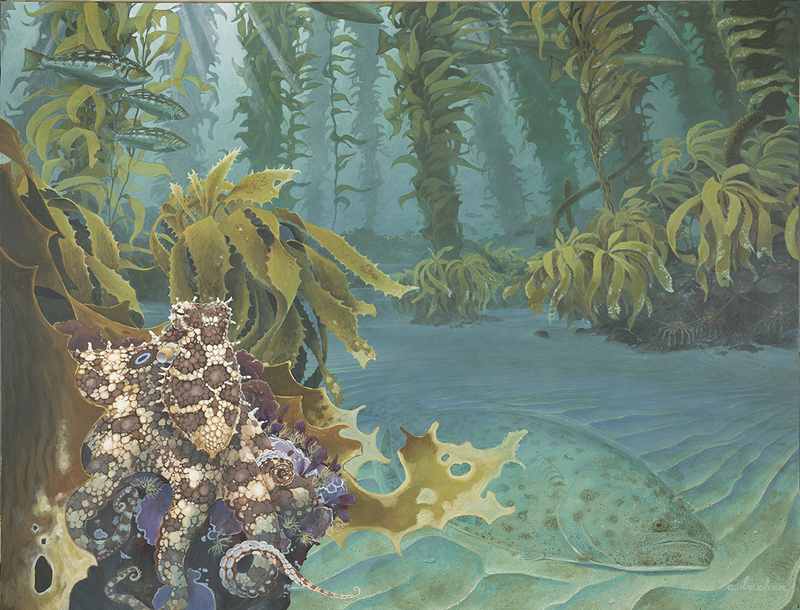 On the other hand for large underwater scenes, I’ve been working mostly in oil. The richness of the pigment and the ability to capture atmosphere and motion make this medium ideal for these types of things. 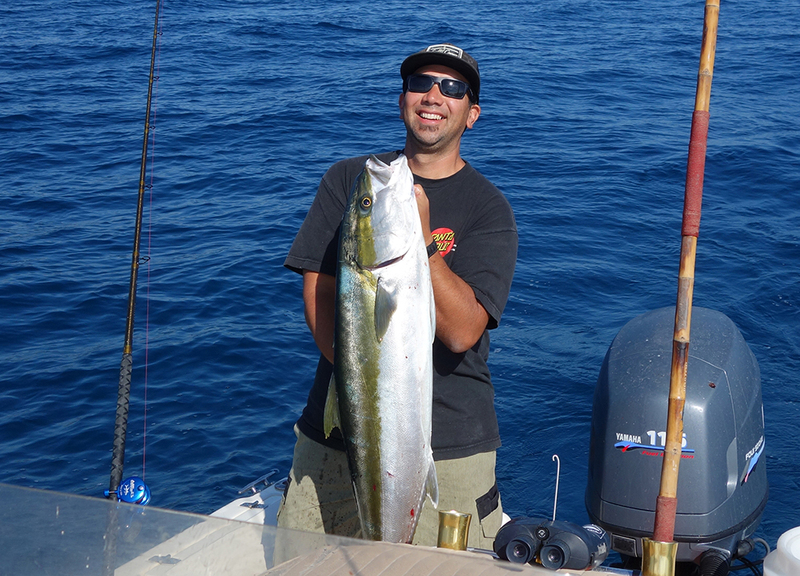 A:I grew up surfing and fishing in Santa Cruz so that’s always been a part of my life. 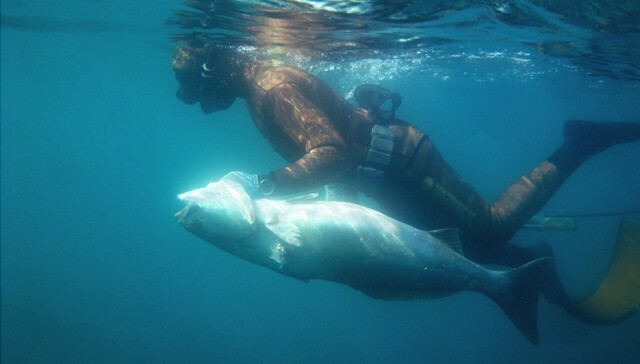 I started abalone diving in northern California when I was in college and that translated into spearfishing. The combination of these three things are really what drives my inspiration and are things I still do on a regular basis to this day. They’ve led me to lots of places on the globe and introduced me to many great people and projects. A:I got started by just drawing and painting on my own. I was really into the scientific illustration style so much that I pursued a master degree in that field. That was the beginning of me constructing the foundation of my style. From there my goal has been to look for ways to translate this more commercial style into the fine art world. I think this has forced me to loosen up a little bit and capture mood and energy as opposed to, yet not sacrificing, accuracy and realism. 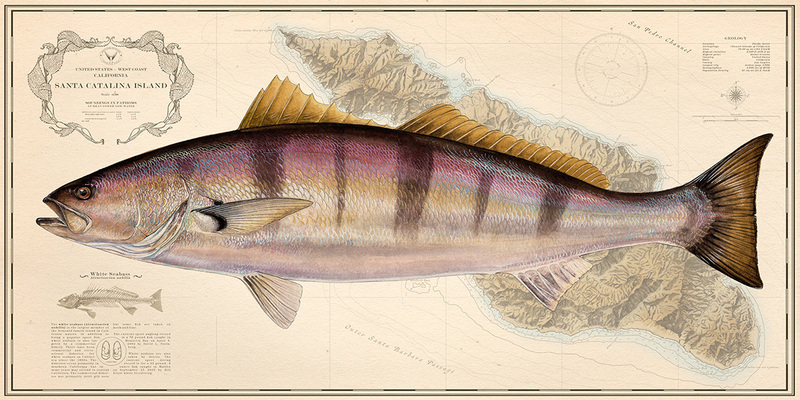 A:To give anglers, divers, and landlubbers visions of the marine environment that are seldom seen or rarely experienced. In the future I’d like this to dovetail with imagery of our fishing culture and history that has only spoken in words or crusty black and white photographs. A:Movement, energy, life, death, respect, truth and lies. A:I’m fortunate to not have to look too hard for inspiration. 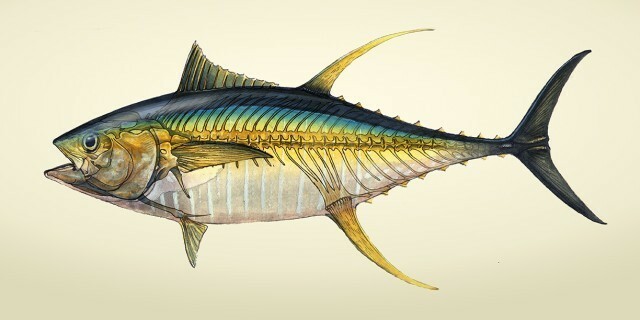 I fish, I dive, spearfish. I spend time on the sea and on the banks of rivers experiencing absorbing all that energy. Immersing myself in it. Adrift on the sea with bait wiggling, running to a high spot or just walking on the beach throwing rocks with my daughter, absorbing the vastness of the ocean is where these inspirations are crystalized. It allows me to clear my mind of all the crap, focus on ideas, experiences, and compositions then formulate a plan to get those down on paper. A:Time. There is not and will not be enough time to put all the things I have in my head into paint. A:I painted a large 5×4-foot composition depicting a view from 60-feet underwater looking out over a sand channel into a vast kelp forest. The visibility is about 100-feet and lying in the sand is a huge halibut. Calicos are hovering in the columns of kelp coming held fast to the bottom while a school of white seabass breeze the middle of the canopy looking for love or a bite to eat. The cracks in the rocks are full of bugs and big abalone with a big sheephead silhouetted off in the distance. The painting, for my friend Guy Skinner owner of JBL Spearguns, was supposed to give the feeling of being underwater in that space. I wanted the viewer to have to hold their breath if the looked at it to long. Once Guy, an avid spearo, hung the art up in his house, his message to me was that it was as close as you could get to the real thing. That is what brings me satisfaction. When someone who knows what I’m painting even better than I do says that I’ve nailed it. This is my goal for every painting I do and luckily it’s happened often. That always brings a smile to my face and never gets old.